When faced with a blocked line, we use cable machines or hydro jetting to clear it up. Each are appropriate for their own purpose- cable machines are used to clear solid and substantial clogs, like tree roots and other firm objects; while hydro jetting is used to remove softer materials that hinder the flow of water in your drains, like grease, dirt, debris, leaves, hair, and other build-ups. When it comes to soft stoppages like grease, etc., a cable machine will glide through the soft build-up; however, high pressure hydro jetting will flush out these softer debris build-ups. 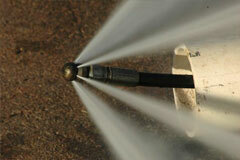 Like the name states, hydro jetting uses high pressured water to forcefully clean out all debris blocking up a line. Should recurring backups occur after repeated blockage clear ups (either via cable machines or hydro jetting), E.Z. Roth Plumbing can perform an In Line Camera Inspection to determine the cause of the problem. Should the problem be severe, a sewer line replacement may be necessary. Restaurants, food services, and other commercial business usually need regular high-pressure water jetting since their sewer lines accumulate an unusual amount of grease and oil by-products, due to the nature of their business. For preventative maintenance and in order to keep your drains flowing freely, we strongly recommend regularly scheduled hydro jetting. Based on the nature and activity of your business, high-pressure water jetting maintenance may vary from monthly, quarterly to one or two cleanings annually. A clogged or backed up sewer line causes down time, and down time in any industry translates to lost clients and income. As a cost saver, regular preventative maintenance avoids unexpected down-time lost income and sudden emergency calls for drain & sewer stoppages or a potential sewer line replacement.